Height adjustable from 30" to 36". Heavy Duty 13-gauge steel legs. Tested to 1,600 Lbs Weight capacity. Various Chemicals and scratch resistant powder paint. Meet all local, state, and federal specifications. This Workbench features the finest channel leg design available in the USA today. Height adjustment is made at the top of the leg for convenience. Standard workbench colors are Blue, Gray or Black - please specify. Select from Genuine Formica Laminate, LisStat ESD Laminate, 304 Grade Stainless Steel, or Butcher Block tops. Butcher Block tops are a combination of ash and maple hardwood strips for durability. Our ESD workbench comes with wrist strap jack on each side, a 10' green grounding wire and aluminum sheet underneath the ESD top for maximum conductivity. Standard Formica Laminate top colors available in Frosty White, Black, Desert Beige, Gray or Oak - please specify. LisStat ESD laminate available in White, Gray or Black  please specify. 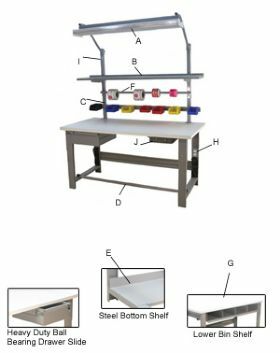 Class 100 Cleanroom tops available and other colors, sizes, and options are available - contact dealer for more information. FOB Shipping Point. Adjust the height of the optional shelves, lights, bin box rails and roll holders on 1" centers with a turn of a knob. D x L Wt. (lbs.) Price Ea. Ltr Id Product No. Description Wt. (lbs.) Price Ea.